This anklet was designed for a woman who needs a larger size in an anklet. 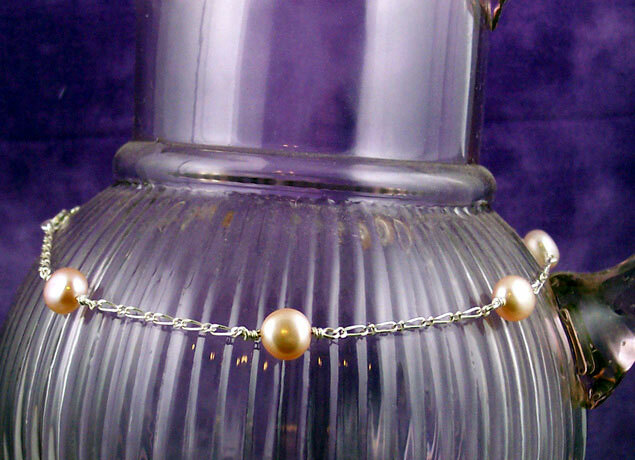 It is made from sterling silver .5 mm 1 + 1 figaro chain and 9 mm Pink/Mauve Freshwater coin pearls. The coin pearls are hand wired in between lengths of the figaro chain with .999 fine silver wire and finished off with a sterling silver trigger clasp and a 4 x 6 mm soldered oval jump ring.